Global warming may be a popular topic in the news this year, but Earth is no stranger to high temperatures. Geologic evidence suggests long periods of time existed in Earth’s history where global warming was the rule, rather than the exception. A recent expedition to the Arctic Ocean collected sediment cores that reveal a changing ecology in the region due to abrupt climatic warming 55 million years ago. Photograph is by Martin Jacobsson. Such was the case in the 10 million years following the death of the dinosaurs. Earth experienced a very gradual, long-term warming, likely due to volcanic activity. But then, at approximately 55 million years ago, chemical indicators in fossils and sediments suggest that a much more rapid warming occurred. This warming provided mammals with an opportunity to take over the world. The diversity and range of the mammal population exploded, with new species appearing in the geologic record and ranging all across the Northern Hemisphere. At the same time, however, deep-dwelling ocean fauna suffered a rapid extinction. Geologic temperature proxies suggest that this rapid warming at the Paleocene-Eocene boundary occurred over a period of 10,000 to 20,000 years in association with a large change in the global carbon cycle. Surface temperatures increased by as much as 5 degrees Celsius in the tropics, and 10 degrees Celsius in high latitudes, then gradually returned to warm background levels over the next 100,000 years. At no other time during the last 65 million years do we have evidence for such a rapid change in temperature. Concern over presently rising levels of greenhouse gases and their effects on future climate has driven researchers to such diverse localities as the Wyoming badlands, the Mongolian desert and the depths of the Arctic Ocean in search of clues to the trigger of the Paleocene-Eocene warming event. They hope that an understanding of the causes and consequences of this ancient warming will provide insight into our future. The warm event, known as the Paleocene-Eocene Thermal Maximum (PETM), first grabbed the attention of the science community in the early 1990s, after paleoceanographers James Kennett and Lowell Stott pulled up a sediment core in the Southern Ocean that showed some interesting changes across the Paleocene-Eocene boundary. By examining the ratio of light to heavy oxygen in the fossilized fauna buried in the sediments of the core, Kennett and Stott were able to infer temperatures for the time. Oxygen has two isotopes found in nature, which differ by the number of neutrons present in the nucleus of the oxygen atom. There is a “light” form, oxygen-16, and a “heavier” form, oxygen-18. The concentration of any one isotope absorbed by these microscopic deep-sea animals will depend somewhat on temperature, salinity and the availability of oxygen isotopes in the water column. Thus, when extracted from fossilized fauna in a deep-sea core, oxygen isotope concentrations can provide a nice record of relative temperature changes over time. In the case of the PETM, Kennett and Stott used the oxygen isotopes to find an increase in deep-ocean temperatures of 8 to 10 degrees Celsius at the Paleocene-Eocene boundary. High-latitude sea-surface temperatures inferred from plankton fossils showed an increase of similar magnitude. Carbon also has two naturally stable isotopes: carbon-12 and carbon-13. Plants and animals preferentially take up the lighter form of carbon, but fauna from the PETM in the core examined by Kennett and Stott exhibited an unusually high concentration of carbon-12, indicating that perhaps something was happening in the atmosphere to change the ratio of carbon-12 to carbon-13. Coincident with this “excursion” of carbon-12 in the carbon isotope record and the inferred increase in deep-sea temperatures at the PETM, the fossil record suggests there was a large decrease in the diversity and abundance of deep-dwelling creatures. Whether it was the large increase in temperatures that made for a hostile environment for the plant life, or changes in ocean circulation that reduced the supply of oxygenated waters from the surface to the deep ocean, remains uncertain. Subsequent sediment cores collected from around the world during the past 15 years have supported the initial data of Kennett and Stott. Most recently, in June, Appy Slujis and colleagues published data in Nature from a new core extracted from the Arctic Ocean that has provided a clearer picture of the ecology of this region at the time (see Geotimes, August 2006). The presence of the subtropical dinoflagellate, Apectodinium, across the PETM in the Arctic core, suggests that this region warmed considerably, from a background temperature of 18 degrees Celsius in the Late Paleocene to more than 23 degrees Celsius during the PETM. An increased amount of pollen in the core also suggests a warmer climate, and perhaps, a longer growing season. In fact, the sudden dominance of Apectodinium across the PETM appears to be a global event. Erica Crouch and Henk Brinkhuis, publishing in Geology in 2001, confirmed increases in levels of Apectodinium across the PETM at other localities as diverse as Austria and New Zealand. Its presence in sediments that were once along the continental shelves in both hemispheres suggests that global sea-surface temperatures significantly increased or that marine surface-water productivity significantly increased, or both. While marine fauna generally suffered high mortality, Apectodinium seems to be the one beneficiary of the changes at the PETM. Continental land surfaces felt the heat as well, as evidenced by carbon and oxygen isotopes from fossils of terrestrial fauna and flora. What benthic fauna saw as a catastrophe, mammals took as an opportunity. Bridges of land surrounding the Arctic ocean and warm temperatures with very mild winters allowed animals to expand their ranges to higher latitudes and easily migrate between continents. Indeed, it was generally warm enough that crocodiles could survive in the Arctic Circle. Fauna diversified rapidly, with the first appearances of primates and hoofed mammals, among many others. Last year, a team of researchers lead by Scott Wing of the Smithsonian National Museum of Natural History published the first record of megafossil vegetation from the PETM, unearthed in the Bighorn Basin of Wyoming. Given that the warm interval only lasted about 150,000 years, it has generally been difficult to find samples of vegetation from such a small slice of time. Digging through dusty layers of strata for fossil plants from the PETM can be a challenging prospect. Although today in the Wyoming badlands, summertime temperatures can reach close to 100 degrees Fahrenheit and rain is sparse, it is the place to look for fossil plants, as the fossil record suggests that Wyoming was not always so hot and dry. Judging from fossilized vegetation, it was likely quite wet in the continental interior, with mild seasonal temperature variations. From the large palm fronds unearthed in this region, it is easy to imagine a very altered landscape, one teeming with life and lush vegetation. So far, the Bighorn Basin has yielded the only plant fossils from the PETM, and the fossils suggest that some types of tropical plants could have extended their ranges as far as 1,500 kilometers northward in response to the warming event. So what is the culprit in this ancient global warming event? It’s important to keep in mind that the rapid warming during the PETM was superimposed on a longer term gradual warming through the Late Paleocene, which peaked approximately 50 million years ago in the Early Eocene. Through this time, considerable volcanism in the North Atlantic gradually built up the concentration of carbon dioxide in the atmosphere. These events alone, however, do not explain the sudden and very rapid increase in temperatures across the PETM. The light carbon isotope ratio found both in the ocean and on land during the PETM is the key to understanding the causes of the rapid changes. Whatever triggered the warming involved the release of large quantities of light carbon into the ocean-atmosphere system. Paleoceanographer Gerald Dickens of Rice University has suggested that this light carbon came from microbially generated methane buried in sediments along the slopes of the continental shelves (see Geotimes, November 2004). This methane exists along our coasts today, frozen in the sediment at low temperatures and high pressures. The microbes produce methane highly concentrated in carbon-12. An increase in temperature or a decrease in pressure in the ocean waters overlying these sediments can melt this buried methane and allow it to bubble to the surface. For several years, this methane “hiccup” was regarded as the best possible explanation for the rapid warming at the PETM. Despite the fact that it nicely explained the carbon-12 increase, however, this hypothesis left a few questions unanswered. First, the hypothesis did not invoke a mechanism for warming ocean waters to destabilize the methane (although it is possible that ocean waters reached a threshold temperature after warming gradually for millions of years). Second, the quantity of methane necessary to explain the carbon isotope ratio, as calculated by Dickens, would be much less than that required to warm ocean and atmosphere temperatures to the extent estimated by PETM temperature proxies and calculated by physical climate models. Dickens calculated that the release of methane at the PETM would result in an approximate 60-parts-per-million increase in atmospheric carbon dioxide (compared with the modern rise of nearly 100 parts per million in atmospheric carbon dioxide concentration over the 19th century). Climate models suggest that atmospheric carbon dioxide concentrations would need to increase, at the very least, by 1,000 parts per million, to warm high latitudes by 8 to 10 degrees Celsius. 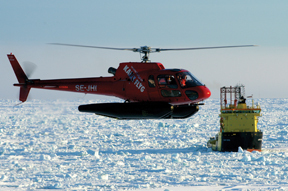 In 2004, new evidence from the Norwegian Sea for an alternate source of methane helped scientists to revise ideas about events at the PETM. A team of geologists led by Henrik Svensen of the University of Oslo discovered hydrothermal vent complexes — thousands of them — dating back to the Paleocene-Eocene boundary. These vents form when melted rock from the mantle seeps into carbon-rich sediments. The heating and melting of these sediments can lead to a buildup of gases — and, ultimately, an explosive release. As the carbon in these melted sediments was originally deposited as the result of biologic activity, it tends to have a fairly low ratio of heavy to light carbon, and thus, is consistent with the light carbon ratio at the PETM. The general consensus now among the scientific community is that some activity associated with these hydrothermal vents provided a trigger for the release of microbially generated methane from the slopes of the continental shelves. While the bottom-dwelling fauna eventually recovered from the effects of the PETM, the lasting impacts of the high-latitude mammal migration remain with us today. The explosion in mammal diversity ultimately changed the face of Earth, as mammals grew larger and more numerous. The PETM provides us with an important lesson regarding Earth’s natural warming mechanisms. Stores of methane presently buried in our ocean sediments could have an accelerating effect on present-day warming, if ocean waters warm sufficiently to release this methane. Although the ecological impacts of a rapid increase in global temperatures are different in the modern world, they are no less significant. Further research into the changes at the PETM will provide us with a better understanding of consequences and feedbacks of such a jolt to our climate system. Shellito is a professor of meteorology and climatology at the University of Northern Colorado in Greeley, whose research focuses on paleoclimate modeling. Email: lucinda.shellito@unco.edu. In the summer of 1970, the research vessel Glomar Challenger drilled under the Mediterranean Sea. Beneath the seabed, scientists found a layer of evaporite minerals, including anhydrite, gypsum and halite, that had precipitated from dried-out seawater. The deposit looked like it had been laid down under very shallow-water to intertidal conditions, yet it was sandwiched between deep-ocean sediments. The inescapable conclusion was that the deep Mediterranean had once been dry land. Approximately 6 million years ago, the Mediterranean Sea dried up, only to be refilled a few hundred thousand years later. Geochemical evidence from sediments in Sicily and the surrounding area provide clues about what caused the drying up, as well as about the two rivers (the Eosahabi and Nile) that ultimately ended the event. Image is courtesy of NASA. In his classic 1983 book The Mediterranean Was a Desert, geoscientist Ken Hsu paints a dramatic picture of a “deep, dry, hot hellhole,” some 3 kilometers below global sea-level. This regional geocatastrophe is known as the Messinian Salinity Crisis, named after the stage at the end of the Miocene epoch when it happened, 7.2 million to 5.3 million years ago. According to Hsu and his colleagues Maria Bianca Cita and Bill Ryan, the crisis ended suddenly, with the Atlantic pouring through the Straits of Gibraltar as a giant waterfall “one hundred times bigger than Victoria Falls and a thousand times grander than Niagara.” The Hsu-Cita-Ryan model has since passed into folklore, widely regarded as the most dramatic example of sea-level change in the geologic record. Since then, researchers have repeatedly invoked a dry Mediterranean seabed as a temporary land bridge to allow migrations of land animals and the subsequent isolation of particular species. The notion of a dehydrated Mediterranean Sea also has some other implications, including a disconnect between the Mediterranean Sea and the Atlantic Ocean, and that the basin floor was a wasteland, virtually devoid of life — until, that is, water flushed back in and reconnected the bodies of water. For the past few decades, geologists have been investigating the Messinian crisis using an array of different methods, illuminating the processes that initiated and ended the event. They are finding that much of the old Hsu-Cita-Ryan model should now be taken with a grain of salt. Drying out the Mediterranean requires two things — physical isolation from the rest of the world’s oceans and extreme aridity. The isolation is primarily the result of plate tectonics. Africa and Arabia once were separated from Eurasia by the Tethys Ocean. As Arabia collided with Eurasia, the ocean closed, leaving small remnants such as the Black and Caspian seas. The Mediterranean, however, is more complex. Parts of the seabed are Tethyan remnants that are diving into the mantle. But these subduction zones and the mountain belts that form above them are not static. In the western Mediterranean Sea, subduction zones have swept westward toward the Atlantic, with new patches of seabed forming behind them. Their associated mountain belts have acted as lock gates, controlling the flow of ocean water between the Atlantic and the Mediterranean. Svend Duggen and co-workers at GEOMAR at the University of Kiel in Germany recently have shown that migrating subduction affected the Betic and Atlas mountain belts of southeastern Spain and Morocco respectively. At about the time of the start of the Messinian crisis, this process closed the narrow seaways on the outer edge of the belts, and then, at the end of the crisis 5.3 million years ago, it ruptured the mountains, creating the Straits of Gibraltar and reconnecting the Mediterranean with the Atlantic. Tectonics was not the only component to the Messinian Salinity Crisis, however. After all, the modern Caspian Sea is isolated from the world’s oceans, but has not dried up. For the past 20 years, Jean-Pierre Suc and colleagues at the University of Lyon in France have been studying fossilized pollen and spores. They have found that during the Messinian, the Mediterranean regional climate became much drier, based on evidence that the vegetation in the Mediterranean borderlands changed to dry-loving species. That means that the Mediterranean became isolated during an arid time, when evaporating seawater could not be replaced by regional runoff. Thus, it was the combination of tectonic isolation and aridity that proved critical for the drying out of the Mediterranean Sea. The island of Sicily is well-situated for studies of the Messinian. Out in the middle of the Mediterranean, it has acted as a giant tide gauge, charting the ups and downs of sea level. And mountain uplift has created stunning outcrops including those that give the Messinian its name. Working on the island with my friend Mario Grasso from the University of Catania during the early 1990s, I was struck by the dramatic Messinian rock layers. 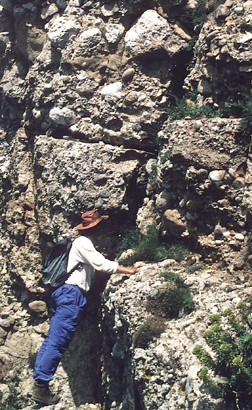 Two distinct sequences of evaporites are separated by a major unconformity, a surface that shows that the area was dried out, which presumably represents the period when Mediterranean sea level was at its lowest. The sediments below the unconformity — the so-called First Cycle — chart deteriorating marine conditions, leading up to full-scale dehydration. These deposits in Sicily testify to climatic changes in the Mediterranean during the Messinian Salinity Crisis, when the Mediterranean dried up about 6 million years ago. The large blocks include angular white fragments of evaporites mixed up with other detritus washed into the basins by rivers that would ultimately cause the Mediterranean to refill. Photo is by Corvillo. Unlike the drill cores from Glomar Challenger from the seabed off Sicily, these First Cycle evaporites found on land had been deposited directly above small coral reefs and deltas, on the edge of the old Mediterranean. These evaporites are free of detritus and bear witness to the lack of sediment entering the Sicilian basins — circumstantial evidence that the start of the salinity crisis was marked by very little input from rivers from the nearby mountains. Above the unconformity are so-called Second Cycle evaporites, but these are very different from the first layer. Gypsum layers are interbedded with thick sequences of detrital sediments, presumably washed in by rivers from the surrounding land. They testify to a flooding of the Sicilian basins at the end of the crisis back to levels near those at the start of the Messinian. Despite recording rise in water levels, however, the Second Cycle sediments are barren of normal marine fossils. Therefore, normal marine conditions had not yet returned to Sicily during this flood. This return to the norm only happened perhaps 200,000 years later, as recorded by Pliocene chalks, which contain abundant Atlantic fauna. These chalks are the first indication of a fully restored connection between the Mediterranean and the rest of the world’s oceans. The question then becomes: Where did the waters responsible for the Second Cycle layers come from, if not the Atlantic? Strontium isotopes hold the answer. Geologists can find the likely sources for the Second Cycle water by comparing the strontium isotopic ratio of the Messinian gypsum crystals to that that of various bodies of water recorded in seashells from the time period. Strontium can substitute for calcium in minerals, and so seashells can record the strontium isotope ratio of seawater when they were alive. Similarly, geologists can fingerprint the composition of the water that precipitated the gypsum in Messinian evaporate layers. Compilations of data from fossil shells from different strata have defined a curve for how this ratio has varied over millions of years in the world’s oceans. The variations in isotopic composition reflect contamination of the oceans from different strontium sources (for example, young volcanoes and old continental crust). Like modern seawater, old samples of the same age give the same strontium isotopic values, indicating that seawater mixes globally. Ocean water during the Messinian had strontium ratios of 0.70889 to 0.70900. In contrast, river water shows great variety in strontium isotope composition, resulting from the different geology of each drainage basin. Shona Keogh, a graduate student at the University of Leeds in the United Kingdom, studied the Sicilian sections with me during the late 1990s and found ratios of 0.70891 to 0.70897 in the First Cycle evaporites, the expected values for global Messinian seawater. So at this stage, the Mediterranean was still connected to the Atlantic. The surprising results, however, came from Keogh’s analysis of Second Cycle gypsum. If the gypsum had formed from the evaporation of global ocean water, then samples should have yielded slightly higher values than the First Cycle. But the strontium ratio results were too low (0.70868 to 0.70878) to have precipitated from normal Messinian seawater. And it could not have come from local rivers because Keogh’s results came from different sites, each of which had different local geology. More remarkably, the same values were obtained by other researchers from late Messinian strata throughout the Mediterranean. This meant that the gypsum of the Second Cycle was precipitated from the same, Mediterranean-wide, water body. Now, the trick was finding out exactly what caused the waters to rush back in. The old Hsu-Cita-Ryan model proposed that the Eastern Mediterranean was partially refilled during the late Messinian by water from “paraTethys” — essentially the Black Sea. To do this for the whole Mediterranean is like trying to fill a bath with the contents of a wash basin — the volumes don’t work. Another source is needed. Given the strontium isotope results, it could not have been water from the Atlantic, especially because the late Messinian strata are largely barren of normal marine fossils. That leaves rivers. During the Messinian, the climate of northern Africa appeared to have been quite humid, unlike the now-dry Mediterranean. Indeed, much of what is now desert was damp. A river called the Eosahabi once drained northward from Chad into the Mediterranean at the Libyan coast. Seismic work also has shown now-buried gorges beneath the modern Nile delta. One gorge goes upstream as far as Aswan, hundreds of kilometers inland. It seems that both the Nile and the Eosahabi helped end the crisis. Dave Griffin, a petroleum consultant working in the Red Sea area who discovered much of these river connections to climate, proposed that variations in the strength of the Indian monsoon, perhaps linked to the uplift history of the Tibetan plateau, brought dramatically increased rainfall to North Africa. Perhaps this rainfall was the source of the Second Cycle water and brought the crisis to a close. In fact, the strontium isotopes suggest it did. Modern Nile River water has a strontium ratio of 0.70600, a low value picked up from basalts at its headwaters in Ethiopia. This river water flowed north, mixed with any residual seawater and gave the late Messinian Mediterranean a distinct strontium isotope composition. Eventually, the water levels matched those in the Atlantic, tectonics opened the Straits of Gibraltar, and the Atlantic mixed in, bringing its sea life. It is not surprising given the dramatic appeal of huge waterfalls and now-flooded deserts that the Hsu-Cita-Ryan model continues to capture the imagination. Researchers still use it to model the seawater budgets, to estimate the rates of refilling and the erosion rates at Gibraltar. But in reality, Hsu’s Gibraltar waterfall may not have been so dramatic after all. Perhaps the real drama lay all around the Mediterranean in a complex chain of events. The drying of the Mediterranean came about by combination of tectonic and climatic effects. Both acted over long periods, with the remorseless redistribution of land masses through plate tectonics. Climate has been more fickle, but the arid period for the region started perhaps a million years before the tectonic isolation of the Mediterranean. These origins of the crisis also ensured its end. Monsoonal rain in North Africa, with associated river down-cutting, poured water into the near-empty Mediterranean, returning its level to near that of the Atlantic beyond Gibraltar. Dating a sequence of interbedded lavas and limestones in the Messinian seaway through the Atlas mountains of Morocco, Phillipe Munch and colleagues at the University of Provence in Marseille have estimated that the marine connection with the Atlantic was only closed for at most 450,000 years. So the Salinity Crisis was over in a geological blink of an eye, perhaps more with a whimper than a bang. In those few hundred thousand years, the rivers of the Mediterranean borderlands carved deep gorges, and sank deep caves. These dramatic landscapes remain today, hidden beneath the holiday resorts, ice cream shops and beaches. Butler is a reader in orogenic geology at the University of Leeds in the United Kingdom. For more information on the Sicilian data, visit earth.leeds.ac.uk/tectonics/messinian. E-mail: butler@earth.leeds.ac.uk. First identified more than two centuries ago, mass extinctions remain a fruitful area of study with many questions still unresolved. Of the so called “Big Five” mass extinctions — at the ends of the Ordovician, Devonian, Permian, Triassic and Cretaceous periods — the end Permian, or the Permian/Triassic (P/T), extinction approximately 250 million years ago was seemingly the most catastrophic for life on Earth, wiping out as much as 90 percent of marine life. 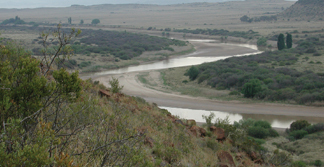 The Caledon River in South Africa cuts through rocks that are about 250 million years old and that mark an extinction interval, in which as much as 90 percent of marine life on Earth died. New research is showing that the causes of the event are manifold, including volcanism.Photograph is by Peter Ward. So profound was the mass extinction ending the Permian that even in the early years of geology, scientists recognized it as a global event with only one equal, the mass extinction at the Cretaceous/Tertiary boundary (K/T) 65 million years ago, which killed off most dinosaurs. These two great bookmarks in the history of the planet become the divisions of the geologic eras as defined by John Phillips in 1860. Today, the P/T and K/T mass extinctions remain the focus of ongoing research. The new take in recent years is that the two events were similar only in their destructiveness, with each extinction having a very different cause. Only one of them — the K/T — appears to have had an extraterrestrial cause. The causes of the P/T appear to be a more complex brew. The widespread study of extraterrestrial events as a possible cause of mass extinctions on Earth began with the seminal discovery of the role of an impact event in the K/T mass extinction, and today this hypothesis still remains unfalsifiable. Subsequent to the K/T work, the P/T mass extinction has also been linked with a large impact on Earth. But if a large impact caused both mass extinctions, we might expect similarity in evidence. Yet, increasingly, the P/T extinction exhibits very different patterns of evidence than the K/T, in terms of, for example, carbon isotope records, fossil records of extinction and recovery, and boundary layer geochemistry. The acceptance of the impact hypothesis for the cause of the K/T was in no small way accelerated by the understanding of its various kill mechanisms. It made sense: A large rocky body colliding with the Earth at high speed creates lots of ways to kill life in vast quantities. This intuitive understanding in no small way helped the acceptance of this hypothesis. The main competing hypothesis for the P/T, however, that flood basalt volcanism — large volumes of lava pouring out of cracks in Earth to cover large land or undersea areas — somehow produced mass extinctions, has suffered from a lack of any compelling kill mechanism. Lava, not exploding out of some volcanoes, but rather, dribbling out of cracks does not conjure up mass death. Yes, global warming brought about by increasing carbon dioxide and methane levels in the atmosphere through such volcanism would certainly have caused changes in the lives of the many organisms then on the planet — but would these changes have been sufficient to have caused such a large proportion of plant and animal life to go extinct? Thus, for the past two decades or more, geoscientists have wrestled with the evident coincidence of large flood basalt events and mass extinctions (including more than the P/T and K/T events, although in the latter case, the peak of flood volcanism does not coincide with the mass extinction). Yet, there has been the nagging worry that some crucial part of the kill mechanism was still undiscovered. Now, in the first half of this decade, that conundrum may finally have been solved. New and better evidence has been rapidly accumulating, resulting in a much better understanding of what did — and did not — cause the Permian extinction. The evidence is manifold, showing climatic and oceanic changes that were coincident with flood volcanism. First, new work is showing that the extinction was not likely a single dramatic event. The paleontological record shows a succession of extinctions, rather than an instantaneous extinction pattern. Additionally, most P/T rocks sampled for carbon isotopes show multiple swings in carbon-13 prior to, and for millions of years after, the extinctions. Carbon isotopes provide a record of changes in the way that carbon flowed through earth systems, including the ocean, atmosphere and biosphere. During times of mass extinctions, which affect plant life as well as animals, the loss of photosynthesizing plants caused major changes in the ratios of the carbon isotopes, as photosynthesizing organisms preferentially use carbon-12, the lighter isotope, over carbon-13. This new carbon isotope work has been especially important in differentiating the P/T extinction from the K/T. It appears that significant carbon-13 perturbations continued well into the Triassic, following the deposition of what is defined as the P/T boundary. Several hypotheses could explain these trends. One possibility is that a catastrophic methane release added carbon-13-depleted carbon dioxide to the global atmosphere-ocean reservoir. Alternatively, the exposure of buried organic matter could have led to such a change. Two other possibilities are that the changes occurred from low-oxygen water overturning, or from massive carbon dioxide releases during volcanic activity. Regardless of the cause, however, these carbon isotope patterns at the end of the Permian differ markedly from the observed pattern of these same isotopes from K/T sections — showing that isotopic perturbations both preceded and long post-dated the traditionally defined P/T boundary. Based on these observations, it may be more accurate to describe a latest Permian through early Triassic extinction interval, than it is to discuss a P/T boundary event. The P/T thus shows prolonged periods of recovery from the mass extinction with evidence of long-term anoxia — periods when the ocean bottom, and perhaps even its surface regions, lose oxygen. There is also mounting evidence for significant global warming during the P/T transition based on paleoclimate data, possibly spurred by runaway greenhouse conditions due to either massive volcanic eruptions or perhaps massive methane releases. But perhaps the most compelling evidence to come forward in recent times on the P/T extinction comes from biomarkers — the remains of living cells that are capable of becoming preserved in sedimentary rocks. They are “soft” fossils in that they are not skeletal remains, but complex organic molecules tough enough to resist change if buried in sedimentary rock. In P/T times, the presence of one such molecule — isorenieratane — suggests large-scale blooms of photosynthesizing sulfur bacteria, which could have played an important role in the actual kill mechanism behind the extinction. Scientists have long known that low-oxygen conditions prevailed in the oceans around periods of mass extinction. Recent modeling by Robert Berner of Yale University indicates that the atmosphere during the Devonian, Permian and Triassic mass extinctions had less oxygen than the 21 percent we find today. Volcanic activity would have raised carbon dioxide levels in the atmosphere, causing the low-oxygen conditions. But that process alone does not necessarily explain the massive marine extinctions at the P/T. It also does not account for plant deaths on land because they would be expected to thrive on increased carbon dioxide. Something more had to be happening. The isorenieratane biomarker evidence, found in oceanic sediments from the Permian and Triassic, indicates the presence of hydrogen-sulfide-metabolizing green and purple sulfur bacteria. Further supporting this find, Roger Summons of MIT and colleagues have conducted studies at numerous P/T sites across the globe, finding multiple signs of high-sulfur conditions. The concentration of this gas in seawater, along with some gas escaping into the atmosphere, points to what may be one of the most important kill mechanisms throughout Earth’s history. Calculations by Lee Kump and Michael Arthur of Pennsylvania State University indicate that enough hydrogen sulfide was produced at the end of the Permian to cause extinctions both on land and in the sea. Their models have shown that if deep-water hydrogen sulfide concentrations increased beyond a critical threshold during oceanic anoxic intervals, then the usual barrier separating sulfur-rich deep waters from oxygenated surface waters could have risen abruptly to the ocean surface. The horrific result would be great bubbles of toxic hydrogen sulfide gas rising into the atmosphere. Kump and Arthur estimate that the amount of hydrogen sulfide gas entering the late Permian atmosphere was more than 2,000 times greater than the small modern flux that comes from volcanoes. Enough of it would have permeated the atmosphere to be deadly, particularly because the toxicity of hydrogen sulfide increases with temperature, and the extinction seems to have occurred during a short interval of global warming. In addition to the toxicity of the gas itself, the gas would have attacked and destroyed some or all of the planet’s ozone shield, an atmospheric layer that protects life from dangerous levels of the sun’s ultraviolet (UV) radiation. Evidence that this happened at the end of the Permian exists in fossil spores that have deformities that would be expected from extended exposure to high UV fluxes (see Geotimes, October 2005). Today, we can also see that under ozone holes, especially in the Antarctic, the biomass of phytoplankton rapidly decreases. If the base of the food chain is destroyed, it is not long until the organisms higher up are in dire straits as well. Thus, a seemingly simple case of impact versus flood volcanism turned into a much more complex scenario, in which volcanism may have led to atmospheric and oceanic conditions that triggered yet more ecological change. Although the jury is still out among popular opinion in the larger scientific community, among many working on this profound event, it appears that Mother Earth was her own worst enemy from 251 million to 247 million years ago — a time that now is more properly thought of as the Permian Extinction Interval, rather than a simple, easily recognizable boundary. Ward is a paleontologist at the University of Washington in Seattle, and also conducts research with NASA’s Astrobiology Institute. He describes this work in more detail in two books now in press: From This Air (The Joseph Henry Press, 2006) and Under a Newly Green Sky (Smithsonian Books, 2007).